Stand Up For Stockwell: A new progressive coalition? Really? Sorry to get distracted by national politics briefly, but we have experience in Lambeth of what a Tory-Lib Dem coalition looks like. Sadly it seems history is repeating itself. Much will be made of the 'reshaping' of British politics today, and how it is a momentous event, etc. But when the dust settles we should consider a few of the announcements that were made today and will no doubt get buried in the news cycle of the new Cabinet appointments. Firstly, NHS spending will not rise in real terms under a Liberal-Conservative coalition. 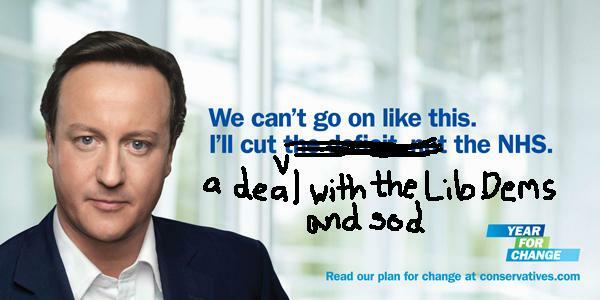 It has only taken one day for Cameron to break one of his campaign pledges - remember this poster? Secondly, the new Minister for Equalities, Theresa May, has a shameful record on, erm, equalities issues. She has voted against equality legislation, such as stopping IVF practitioners discriminating against lesbians, equalising the age of consent, and failed to turn up for the Section 28 vote. Read her votes on key issues here: http://is.gd/c5XsF. There are few (currently only two) women in the Cabinet, and no ethnic minorities. To cap it off, the Tories seem to be determined to prevent their government being held to account by Parliament. They have fixed a five year term of office, and are planning to change the 'no-confidence' motion in the House of Commons to 55% - this means in effect that even if the Lib Dems were to leave the coalition, the government would not need to call an election! 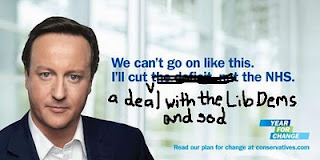 Hardly a very democratic or progressive start to Cameron's new politics.